Join us for an evening of holiday celebration, food and fun. 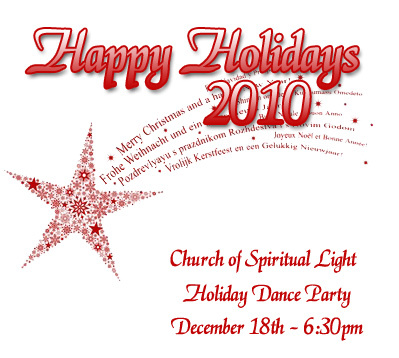 Bring your dancing shoes and get ready to party hearty. Also bring your favorite dish to share. Come together to be with one another, in your sacred space, with your tribal community in brotherhood and sisterhood. We must retrain ourselves and reframe not only our own, but the cosmic shift out of suffering and into our natural state of wellbeing, abundance and joy. Let's end the year by bringing in more JOY! Being more IN JOY - so ENJOY Your Life! Sunday Sermons - IMAGINE JOY! I am a shining star, radiating love to one and all. I take my place in this world and express my special genius. I am supported by the oneness of the Universe to become a unique expression of God/Goddess. The stronger my sense of self, the less I need to prove myself to others or myself. I allow my sense of purpose to full emerge in my life. I tap into the angelic forces to empower and enrich my life. I help others to realize their dreams, when I realize my own. I allow myself to embody grace, peace and poise in all my dealings. As my soul matures, my personality and character align with the Truth of my entire being. My desires are purified by the Light of truth and guided by Love. I am a vital part of the brotherhood and sisterhood of humanity. When I take my rightful place, this allows others to do the same. Others, who are a part of my soul contract, are waiting for me to accept my power. My joy leads me to the Light. Peaceful acceptance of what is leads me to the path of realization of my highest good. I am open to experience more love, peace and joy in my life. I unconditionally love and accept myself exactly as I am in this moment. I surrender to my soul and set my Spirit free. I receive the love of all that is into my being, so that I can share this love freely. My art, my creativity is the gateway to my joy. As I open up and allow others to assist me, I activate the divine template for abundance. I recognize the face of God/Goddess in every living being. Each day I give gratitude for the abundance of blessings in my life. I am thrilled to be a human, alive at this time in our cosmic evolution. The value of my love is priceless to myself and others. I am open to the discovery of my entire being and all the magic contained within. While I am the superstar and lead character of my life experience, it is the desire of the God force within me to be the cause of joy to others. Bringing peace on earth and goodwill toward men is the foundation of all my soul intentions. I follow the instruction of my soul. I now live only by my soul intentions. Permission to freely distribute granted. Crystal Bowl Meditation with Cathy Blair of Naples, Florida on Monday, November 15th at 6:30pm. Join us for this very special, one time event with Cathy. We're lucky to have her in Fort Myers!!! She has 26 bowls, some of which are made of precious and semi-precious gemstones, such as ruby, emerald and my favorite, kyanite and they each have their own special sound. Crystal bowls not only provide a beautiful way to meditate and relax, but also carry profound vibrational healing frequencies to every cell in our body. Come and experience Cathy and her unique array of bowls! The word Yoga means "unity" and is derived from the Sanskrit word yuj meaning "to join". In spiritual terms yoga is about joining the individual "spirit" with the Divine "Spirit" or individual consciousness with Divine Consciousness to realize our already complete nature. 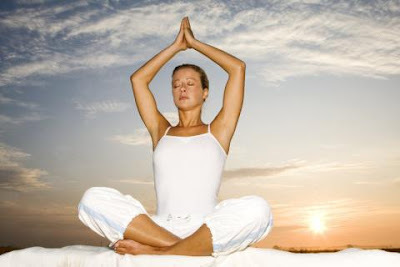 In more practical terms yoga is a means of balancing and creating harmony between the body, mind, breath and emotions. And, like finely woven cloth, yoga weaves together layers of expression to create an integrated whole. Like many before me, I came to yoga to exercise my body. I enjoyed the challenge of putting my body into new and sometimes unflattering positions. And, just like many of my other pursuits I pushed and pushed hard to make my body conform to the yoga body image I saw in magazines and advertisements. But it seems that the practice of yoga will have its way with us and despite the fact I knew nothing about yoga except for the postures, something began to happen in my practice, something startling and seemingly otherworldly. I realized I was on an adventure of exploration and I didn't have to leave my house or even my yoga mat to participate. Yoga has invited me into an "in the body" experience at every level of my being. I realized that the unity or oneness of body, mind and spirit described in yoga is what I had been seeking all my life. So, yoga (not just the postures but the entire philosophy of yoga as outlined in the Yoga Sutras of Patanjali) not only describes this way of being but also gives us all the tools to realize this already existent state. I have not experienced any other body of knowledge that has been the means and the end in and of itself like yoga is. Since those first eye opening experiences when I got the sense that I was exploring my own subtle nature I have begun to study yoga more intently and became a yoga teacher. I have started to consciously explore and I invite my students to explore in their practice who they are at every level of their being; including the mental, emotional, energetic and spiritual levels. As I watch, mentor and guide my students and we participate in each others growth I see that it is important during yoga practice to create a safe nurturing environment where we can learn to perceive ourselves directly, free of judgment and criticism so that all that we are, think we are and wish we were can be exposed in a loving atmosphere. This then becomes the starting point for our exploration, the grist for the mill of self inquiry. We learn we can't hide from ourselves and yoga holds us in arms of compassion during our journey. In our practice we move into Tadasana (Mountain pose), Virabhadrasana II (Warrior II) or Trikonasana (Triangle). What really happens in those poses? How can they deepen our experience of who we are and move us into a deeper knowing of ourselves? I often encourage my students to journal about their experience (as I often do). It is not unusual for a student to sit down in the middle of class; journal nestled on lap, and begin writing about an insight gained during a posture. Sometimes, after class the student will share their experience and sometimes what was revealed to them was too personal and they simply leave quietly with journal and mat tucked under their arm. These to me are moments when yoga is weaving its magic! 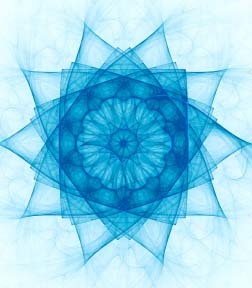 I believe everything we do on or off the yoga mat is a multidimensional expression of who we are. As our yoga practice deepens we begin to see that each posture has many levels of expression. It is really a form within a form created and sustained by the dualities of movement and stillness, tension and relaxation. This could be expressed as the yin and yang of each posture, the coming together and balancing of opposing forces. It is in exploring these energies in every posture that we can begin to understand who we are more deeply. Each posture has an external form, the shape the body takes to be in the posture. This is the active form of the pose. Each pose also has an internal form as our organs adjust to a new physical position. The internal expression is receptive and restful; the expression hidden from the world. At this level of exploration we experience the opposing forces of outward strength and inner stillness. On another level is the energetic expression. We must exert energy to move into and hold a posture. At the same time the posture creates space within for energy to move. We experience energy that moves and creates and energy that sustains and supports. With the breath we discover another expression. The inhalation creates expansion and spaciousness that take us to the dynamic edge of the posture while the exhalation allows us to explore that edge and move deeply, more consciously into the pose. The inner dance of breath and energy echoes the rhythm and pulse of creation and is the bridge between the inner and outer worlds. Each posture has an emotional expression. I find this expression the most challenging and revealing and often it creates the deepest sense of inner questioning. It seems that if we allow ourselves to explore the emotional edge of a posture we can begin to see how even deep seated emotions are changing, fluid and impermanent. We all have our favorite postures that illicit feelings of peace and comfort, surrender and relaxation. What is it about these postures that create those feelings? And we all have the postures we resist. Can we be in those postures and explore our own resistance? Can we allow ourselves to come to our emotional edge and create an inner dialogue listening and responding with compassion, exploring the continuum of emotional expression that is part of the changing nature of emotions? As we explore the full expression of a posture, we explore not only our physical limitations but how we sometimes use our mind and emotions to create limits. Very often our limits, real or perceived, become our teachers, if we explore them with openness, curiosity and nonjudgmental awareness. Yoga is the practice of opposing forces equalizing each other, creating balance and unity. It is the practice of active exploration and resting in the moment. Every posture has the capacity to move us deeper if we allow the full expression of who we are in that moment to be manifest in our practice as we explore the tantalizing synergy created by opposing forces. If we can allow the posture to bloom within us and explore our physical edge with softness, our energetic edge with awareness and our emotional edge with compassion we have the potential to reach inside to our own pool of wisdom and insight and come to a deeper understanding of who we are. In this way there is nothing outside the scope of yoga practice. We can bring this same depth of experience; this same rich tapestry of sensation, emotion and mindfulness to our everyday lives. In this way yoga truly enhances every moment and creates an experience of exploration at every level of our being. 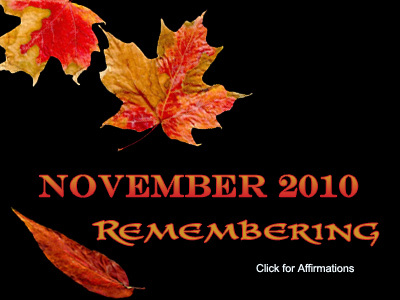 Welcome to November - It's time to Remember! We've had quite a journey this year and will be putting together a special book filled with the highlights and affirmations of each month at the end of the year. It is my hope that you will become aware of how much you have grown in all aspects of your being. I honor those who have followed this path and traveled this journey together. This has been a powerful year and as we approach the last 2 months of the year it is really important to take stock and realize and enjoy what has transpired. Even through the difficulties, when you have a deeper understanding of the interplay of the realities at work in your life, it always brings you to the same thing: without each other it's just not any fun. The closer you get to God/Goddess, the more consciousness you reveal, the lonelier it can become, unless you reach out to others who are traveling this journey. Everything, even our woundedness is driving us to this. So why not remember who you really are and what you really want? Remembering or Re-membering means to recall, recovery and re-establish a connection with who and what you really are. We will be spending this month re-membering and putting the beautiful pieces of this mosaic called you into a beautiful framed work of art. Also, please join us for our Thanksgiving Potluck Feast on Thanksgiving Day, Thursday, November 25, 2010 at Church of Spiritual Light, 1939 Park Meadows Dr., Unit 1, Fort Myers, FL. Click here for more info. I am filled with grace and gratitude for the abundance of this world. I am loved and blessed. There is love and beauty all around me. I access higher realities and bring order to any chaos in my life. I reach out to others to share love and prosperity. I am prosperous beyond my wildest dreams. I desire to receive in order to share the bounty of my life. My life is a sacred trust. I see and get present to myself and others. I see others for who and what they really are. I am in tune with my inner song when I am in service to the Light. I accept my personal evolution and see myself in the highest light. I honor the path of each and every being. I am a multi-dimensional being of light. I am filled to overflowing with gratitude for light, love and life. I call to the powers of the Universe to support and care for myself and others. I am the author of my fate and the creator of my destiny. I remember my sacred contract and open to what is necessary to fulfillment. My sacred contract was created by me and I was born with everything I need to fulfill my destiny. I open my consciousness and expand my awareness to non-local reality to create and enlighten my life. I reach for ever higher and deeper expressions of love. I set my soul free and come to the center of my Self. I am a force to be reckoned with and I use this force to gather my will for the greater good of us all.